Copyright ©1999 S.A.M., All rights reserved. · Different color brushed tip markers to color in the light bulbs and tree. 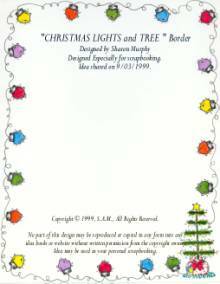 Stamp Christmas Tree in bottom right or left-hand corner of your page. Stamp a Light Bulb image in the other three corners and then in between stamping them at different angles as you go. Connect the Light Bulbs with your black fine line pen by drawing looped lines from one to the other. Color in the images with your Brushed Tip markers. I chose to use the color of the rainbow for this one. Your page is now ready for pictures and journaling. Hope you have enjoyed this border design. I know I have enjoyed designing it and sharing it with all of you! Please Note: This idea may be used for your personal scrapbooking pages only. Altering this handout to look as though you designed this idea is a violation of the copyright. This border along with any other of my borders and ideas I created may not be reproduced or copied to teach, or publish in any idea books or placed on any Web sites without contacting and receiving hand written permission. You may contact me at crafts1@mail.com with comments or questions or write to: Sharon Murphy, 117 Ziegler Road, Leesport, PA 19533. Thank you for your cooperation.